Rudy Giuliani baffled Fox News hosts Monday when he attempted to clarify comments he made on CNN earlier in the day about events related to special counsel Robert Mueller's Russia investigation. 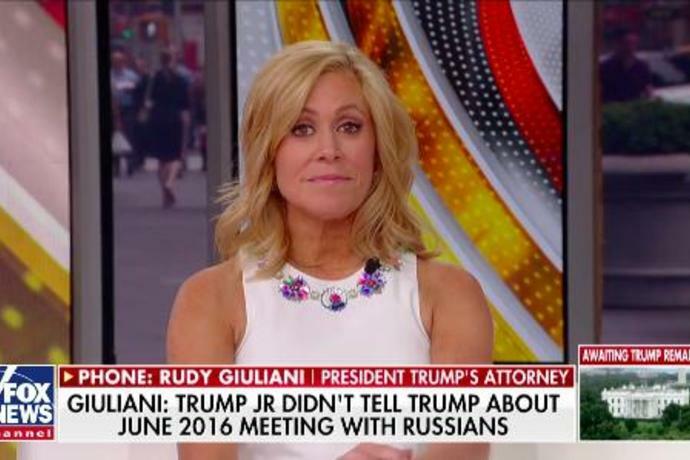 Giuliani had appeared to tell CNN's Alisyn Camerota earlier that President Donald Trump was not present at the infamous Trump Tower meeting attended by Donald Trump Jr., a Russian operative and others in June 2016 ― though the media hasn't asserted that Trump was there. Media pundits immediately questioned why Giuliani would deny an accusation that news outlets hadn't even suggested in the first place. They wondered whether Giuliani was indirectly conceding that Trump knew about the meeting in advance, which Trump's former personal attorney Michael Cohen recently alleged and Trump's team has repeatedly denied. So Giuliani called Fox News' "Outnumbered" hours after his CNN interview to explain his previous remarks. But his comments only further muddied the timeline, as evidenced by the Fox News hosts' confused facial expressions and repetitive lines of questioning. 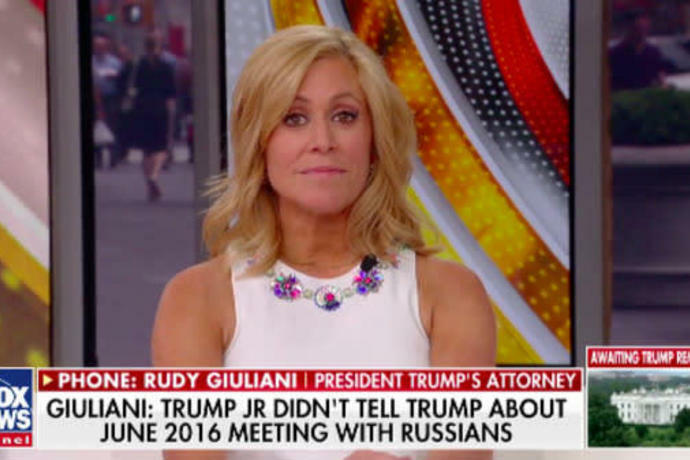 Several "Outnumbered" co-hosts, including Harris Faulkner and Melissa Francis, as well as Fox News contributor Guy Benson, repeatedly asked Giuliani to walk them through all of the accusations about Russia-related meetings. "So let me take you through it," Giuliani said in his first attempt to address his meeting comments. "The day of the meeting with the Russians, Cohen has said ― now he's leaked it, so we're not even sure he's said it, somebody said it for him through a reporter ― he said that he was in President Trump's office, Donald Trump Jr. walked in and told him about the Russian meeting. That is categorically untrue. Did not happen." Giuliani later added: "Second, there was another meeting that has been leaked but hasn't been in public yet," he continued. "That was a meeting ― an alleged meeting ― three days before, according to Cohen ... he says there was a meeting with Donald Jr., with Jared Kushner, with Paul Manafort, with Gates and possibly two others, in which they ― out of the presence of the president ― discussed the meeting with the Russians. ... That meeting never, ever took place. It didn't happen. It's a figment of his imagination." Confused? You're not the only one. Giuliani's clarification prompted a series of inquiries from the Fox News co-hosts. "Why are you saying that the president wasn't at the meeting?" Francis asked. "Who asked if he was there? No one asked if he was there." "Cohen is alleging the meeting took place," Giuliani responded. "We're making it clear the president wasn't at that meeting. Cohen doesn't even allege that. To cut it off." But Francis continued to press him, "It's different to say that meeting didn't happen ... but to say he wasn't there implies that it happened." Giuliani chuckled: "Oh no. As alleged by a liar ― as alleged by Cohen." If Giuliani's goal in his "Outnumbered" interview was to steer Fox News' coverage away from the alleged Russia meetings, he succeeded. By the end of the 25-minute interview, Faulkner was focused on Giuliani's claim that Cohen had secretly recorded what was supposed to be an off-the-record interview between Trump and CNN's Chris Cuomo. It's unclear how Cohen's alleged recording of Cuomo is relevant to Mueller's investigation ― if at all. "Wow, that's a lot of information," said Faulkner. "We appreciate you calling in, and thank you very much for taking all of our questions." Giuliani interrupted: "I also understand the confusion. Believe me, it's going to get more confusing when these other tapes start coming out. But eventually, when you put it all together, it's going to mean the president did nothing wrong." Watch Giuliani's full interview on Fox News' "Outnumbered" below.